South Korean cinema has experienced two major revivals in the postwar era. The so-called “Golden Age” of Korean cinema dates from 1955, when the explosive success of Madame Freedom set the film industry on a path of recovery from the wreckage of the Korean War. The more recent revival in Korean cinema’s fortunes is often said to have started with the release of the blockbuster Shiri in 1999, but one could make a strong argument that the movement really dates from 1996. That year was the start of a five-year period that saw the debut of many of Korea’s most important directors (Hong Sang-soo and Kim Ki-duk debuted in 1996 itself); it was the year in which the Pusan International Film Festival was launched; it saw the abolition of government censorship; and it marked the start of a commercial recovery following a 25-year decline in box office admissions. Coincidentally or not, 1955 and 1996 also rank as the two most important years in the history of Korean film magazines. In 1955, Film World (Yeonghwa Segye) and International Film (Gukje Yeonghwa) were launched as Korea’s first film magazines. Although prior to this time, daily newspapers had provided reviews and commentary on local and imported films, the new glossy monthlies changed the relationship between viewers and the films they watched in theaters – and particularly between viewers and the movie stars they idolized. Like American film magazines of the time, much space was devoted to star profiles, interviews, and industry gossip. By the 1960s, Korea’s star system has become highly developed and was one of the key factors behind its local cinema’s commercial strength. The popularity of film magazines was one important way in which the star’s image was created and maintained. Although individual titles would come and go, the film monthly, targeted at a mainstream reading public, remained a familiar presence in subsequent decades. In the 1980s and early 1990s, the dominant film magazines were Screen and Roadshow, based on US and Japanese publications respectively. However the two magazines that appeared in 1996 represented a very different kind of model. Kino, launched by leading film critic Chung Sung-ill, was an exquisitely produced monthly that came to represent a particular strain of 1990s cinephilia. Although distributed as a mainstream magazine, the famously complex level of discourse in the publication was targeted at the most committed and well-read of audiences. Many treated the issues themselves as collector’s items, or as works of art in themselves – although more than a few Koreans confessed to me that they couldn’t fully understand much of what was written on its pages. Kino enjoyed a distinguished position within Korean film culture, but struggled financially. In July 2003, it published its 99th and final issue. 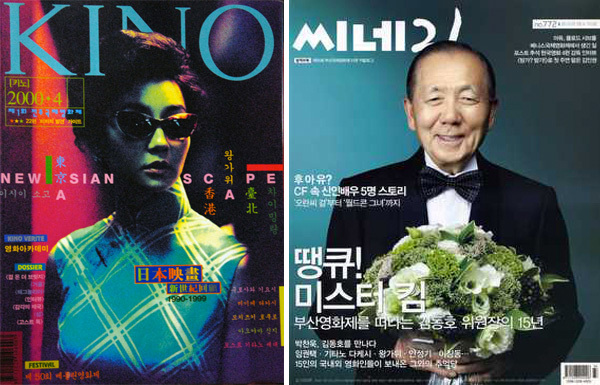 Many interpreted the passing of the magazine as a final confirmation that the era of 1990s cinephilia had been subsumed by the growth and commercialisation of Korea’s film market. The other magazine that debuted in 1996, and which is still in circulation today, was Cine21, published by the progressive newspaper Hangyoreh. In contrast to the magazines that came before it, this was a weekly publication — less glossy, and more focused on news, commentary, interviews and reviews of each week’s new releases. It simultaneously targeted mainstream film enthusiasts and film industry insiders, combining the functions of an industry weekly – like Variety or Screen International – with coverage for the general reader. It was a format that had few precedents in other countries, but it proved to be a success, and for a time in the late 1990s, it ranked as the bestselling weekly magazine of any kind in Korea. In the coming years, competitors would also appear, adopting more or less the same weekly model, most notably Film 2.0, which ran from December 2000 to December 2008, and Movieweek, which has run from November 2001 to the present. Increased competition and the spread of the internet have also led to financial troubles for all the magazines in the market. It is interesting and a bit unexpected that, despite its current struggles, the weekly film magazine should have taken such a strong hold in Korea, when in most countries, the glossier monthly format is dominant. The relatively large size of Korea’s film industry likely played a role in this, in that large numbers of industry insiders were motivated to buy the magazines each week to keep up with the latest developments. At the same time, a highly developed local star system created demand for mainstream articles targeted at ordinary fans. The full influence of film magazines will always be hard to quantify, and so sometimes their contributions are undervalued. But I would argue that the magazines launched in Korea in 1996 and beyond have not merely served to record and interpret the flowering of local cinema during this period, they have also been a major contributor to this movement. As a close observer of the Korean film industry since the late 1990s (and a regular columnist for Cine21 since 2003), I find it hard to imagine the workings of the industry without the information and commentary provided by the film magazines. We use the word “community” to speak of online discussion boards and social networks, in part because we can see with our own eyes the different players interacting with each other. And yet a community in the true sense of the word is more than just a space where different people can interact. It implies a collective sense of shared knowledge, shared interests, and shared values. It imparts context and meaning to the creative contributions of each individual. The real-world community of Korean cinema is particularly cohesive, and although festivals, social gatherings and the internet all play their part in maintaining that cohesion, it is the weekly magazine, in my opinion, that has kept this community informed and connected like no other medium has. Madame Freedom. By Seong-Min Kim and Cheong-gi Lee. Dir. Hyung-mo Han. Perf. Am Park and Jeong-rim Kim. Prod. Dae-hun Bang. SamSeong Film, 1956. Shiri. By Je-gyu Kang. Dir. Je-gyu Kang. Perf. Suk-kyu Han, et al. Prods. Moo-Rim Byun and Kwan-hak Lee. Kang Je-Kyu Film Co. Ltd, 1999. Based in Korea since 1997, Darcy is the founder of koreanfilm.org and the author of New Korean Cinema: Breaking the Waves. In 2009, he was awarded the Korea Film Reporters Association Award.